Garden of Aaron: Winter English Marigolds - A Potential Cover Crop for Flowerbeds? Winter English Marigolds - A Potential Cover Crop for Flowerbeds? Self-sown English Marigolds (Calendula officinalis) in the December garden. 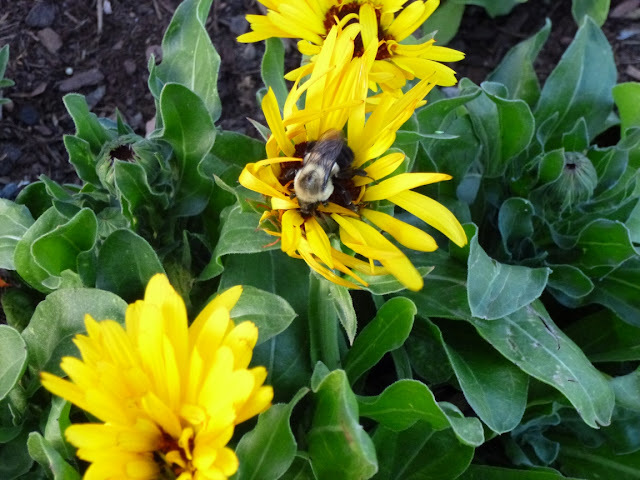 These plants have survived temps in the mid-20s and are pumping out flowers, feeding bees and blocking weeds. The flowers last much longer than the 1st generation of English Marigold flowers did back in May and June. 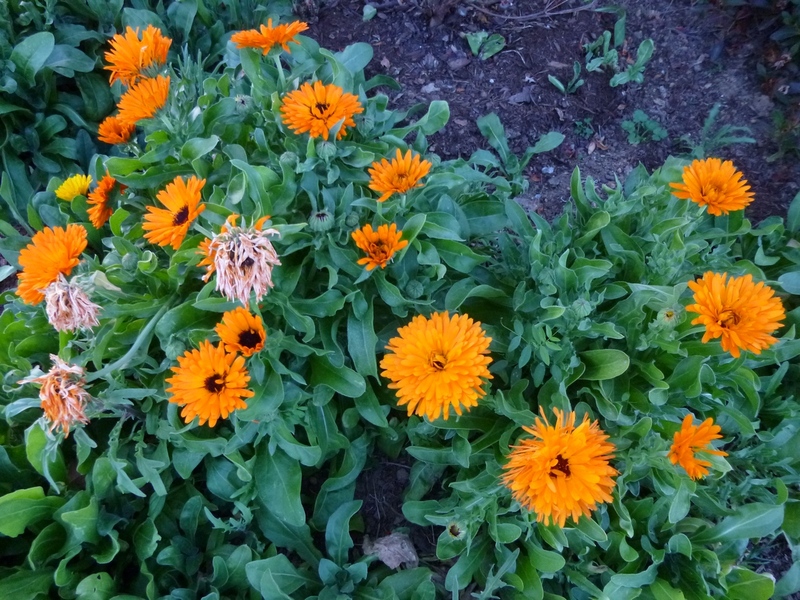 Earlier in the year, I disparaged English Marigolds (Calendula officinalis) for their short-lived flowers. Many of the flowers seemed to live no more than a day before going through various (to my eyes) unattractive stages of decrepitude. Well, as often happens in the garden, time provides some new perspectives. The English marigolds self sowed - no big surprise given the vast numbers of seeds they shed. And since they came up this autumn, they have actually looked much nicer than the spring-sown plants. I'm starting to think that English marigolds should really be planted as a fall crop in Tennessee. While there may not be as many flowers as in the spring, the flowers last much longer, the foliage looks more healthy and they don't even seem to want to form as many seedheads, which makes it much easier to keep up on deadheading them. In fact, I'm going to go a little further and propose a somewhat radical notion: Maybe English Marigolds could be a fall cover crop for gardeners like myself who like to grow annual flowers. Since I don't mulch my beds heavily, I've got quite a few weeds (clover, etc.) coming up in the flower beds, but where English Marigold is thriving, there's nary a weed in sight. I've also been super impressed with the Marigolds' cold hardiness. We're having a nice warm spell at the moment (highs in the 70s, lows in the 50s), but we had a number of nights with temperatures in the mid-20s in November and the English marigolds did not really seem fazed at all. Individual flower stalks sometimes seemed to get frozen, but the mass of Marigolds clustered together and the unopened buds seemed to come through those temperatures just fine. I'm curious to see just how cold it has to get to kill these Marigolds. Teens? Single digits? Now I don't have too much experience with cover crops, but I assume that when it's time to plant perennials or spring annuals, I can just cut down the Marigolds a couple of weeks beforehand and turn them into the soil. What do you think of that idea? Crazy? Or worthy of consideration? Meanwhile, I'm enjoying having flowers blooming in early December. And the bees seem to like having flowers around too! Update (12/11/2012) - After discovering a leafhopper infestation, I have changed my mind on the merits of English Marigolds, begun ripping out the existing plants and returned to my previous belief that the plants are more trouble than they are worth on multiple levels. Gardening, like life, is a nearly continuous learning process in which mistakes are often the best teachers as long as we are humble enough to recognize our errors and seek to do better next season. See what other positions I revise/reverse with a free email subscription. I've never seen these before! I want to get some! Sounds worth trying. Might be more seedlings when you don't want them but so what. Thanks Jason. My thoughts exactly. And as I said in the post, fall-grown English Marigolds don't seem to produce as many seeds (at least not as quickly as in the summertime), which should make it easier to deadhead and prevent a springtime crop of seedlings if you don't want them. The seedlings are also very easy to pull up at any stage, so it's not likely to ever become a weed IMHO.